Quality, price and reputation are key considerations in selecting bottled water. BB&B found all three in Santa Vittoria Acqua Minerale. 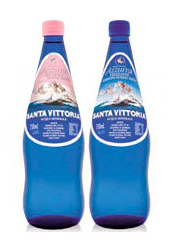 Bottled at its source in the Dolimiti Mountains of Northern Italy Santa Vittoria offers a complete range of sizes and container options for every occasion at sensible prices geared to today's economy. One of the purest waters available, santa vittoria Acqua Mineral is bottled at the source in the Dolimiti mountains in Northern Italy. The light carbonation along with its purity and low sodium level make Santa Vittoria the perfect accompaniment to fine dining as it does not alter the flavour of cuisine. Santa Vittoria mineral water is extracted at a year round temperature of 8 degrees celcius and contains an extremely low sodium level of 0.6mg/L. 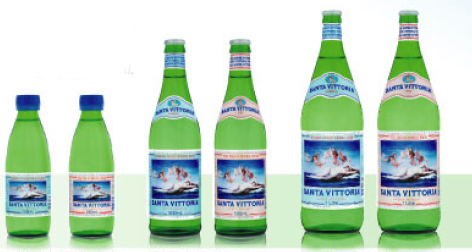 The traditional Santa Vittoria green bottle range available in still and lightly carbonated.